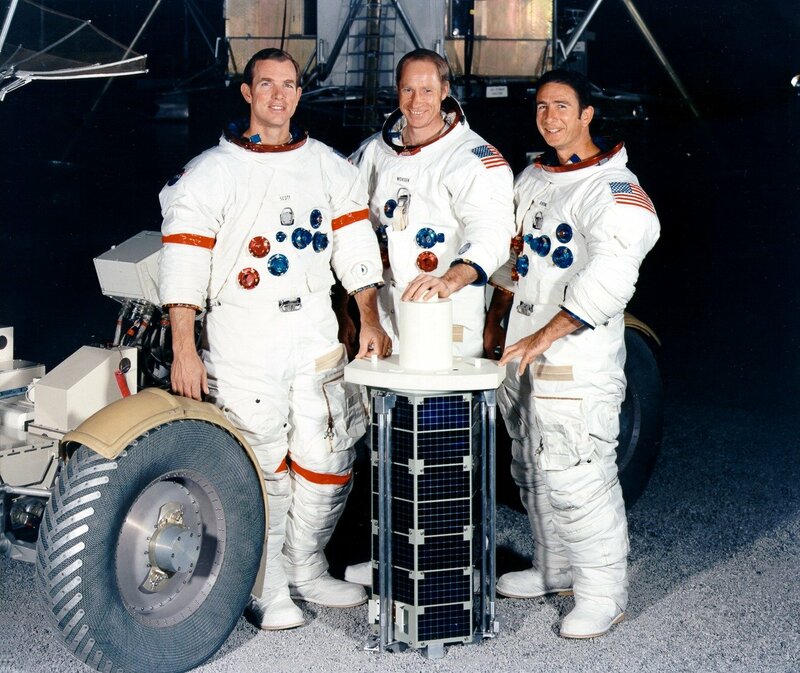 Scott, Worden and Irwin, the crew of the Apollo 15 flight (Figure 13.3-1), secretly took to the Moon, in one of Scott’s spacesuit pockets, 398 postmarked envelopes in addition to the 243 authorized by NASA for commemorative philatelical purposes. Figure 13.3-1. David Scott, Alfred Worden and James Irwin with the subsatellite that they placed in lunar orbit during Apollo 15. NASA photo AP15-S71-22401. They did this on behalf of H. Walter Eiermann, who in turn was working for a German stamp collector, Hermann Sieger. The agreement was that one hundred of these undeclared envelopes (known as covers by collectors) would be sold by the astronauts to Eiermann for 7,000 dollars, deposited on a foreign account for each astronaut, while the other 298 would be kept by the crew as souvenirs. 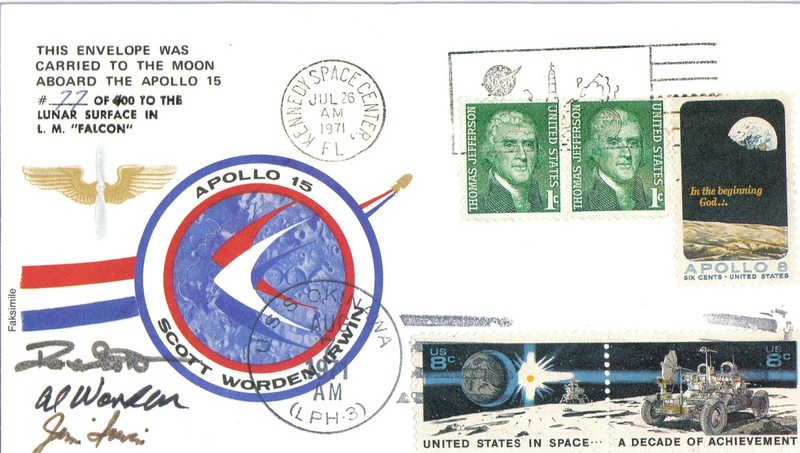 The agreement also included the provision that the Eiermann/Sieger covers would not be sold until the Apollo program was over. Figure 13.3-2. A picture of one of the envelopes taken to the Moon by Apollo 15. Credit: Wikimedia. Eiermann, however, sold his covers to Sieger, who put them on public sale shortly after the Apollo 15 flight. This led to a public scandal and a congressional inquiry that also involved Jack Swigert (Apollo 13), as financial gain from the flights by the Apollo crews was not permitted. The Apollo 15 crew returned their 7,000 dollars, but Swigert, Scott and Worden were removed from service as astronauts and Irwin left NASA to start religious preaching. It should be noted that NASA wrote rules regarding what astronauts could take with them to space, and made it clear that flown items could not be sold but only donated, only after this incident. These rules were strikingly different from the treatment reserved for Mercury astronauts, who were allowed to share a 500,000-dollar contract for exclusive coverage by the Time-Life magazine group. Figure 13.3-3. 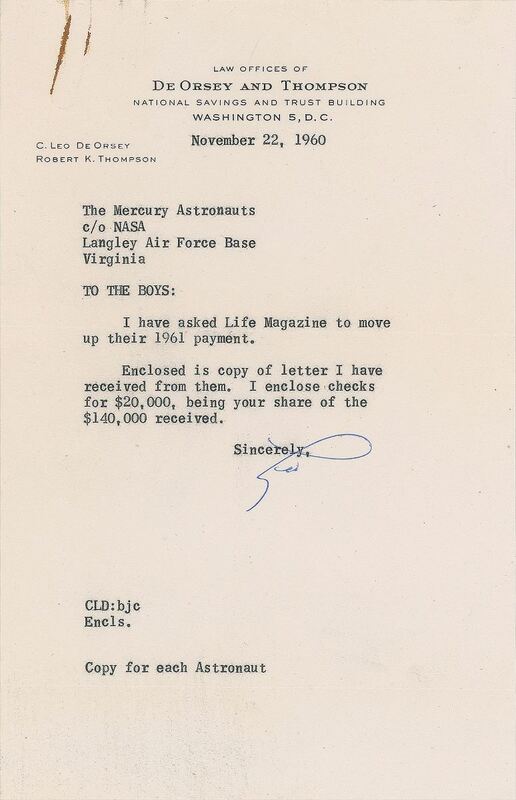 A letter from the DeOrsey and Thompson law office, giving the first installment from Life Magazine to the seven Mercury astronauts in 1960. Credit: Icollector. Moreover, although it is commonly believed that Apollo astronauts were generously paid for their spaceflights, in actual fact they only received standard military salaries. Accordingly, they often tried to provide some kind of financial security to their families in case of death, for example by signing items which would be auctioned off to collectors by their spouses. If they survived, they could receive consulting fees, be paid for public appearances or sell their autobiographies, but only after retiring from active service.